The IWitness Armenian Genocide Education Program integrates voices of survivors and eyewitnesses of the Armenian Genocide into classroom resources that can be used to teach valuable lessons across the curriculum. As students learn about life before, during and after the Armenian Genocide, they recognize the role of empathy and moral responsibility to ensure that acts of injustice, prejudice and violence cease for future generations. Explore this program by using the navigation tabs above to discover multimedia resources that will support you to teach a complete story of the Armenian Genocide. The Armenian Film Foundation was established in 1979 as a non-profit, educational, and cultural organization dedicated to the documentation in film of Armenian heritage and life. Its goals are to inspire pride in and to create worldwide recognition of the Armenian people and their contributions, and to preserve the visual and personal histories of survivors and witnesses of the Armenian Genocide of 1915. Dr. J. Michael Hagopian, founder of the Armenian Film Foundation, released 17 documentary films on Armenian heritage, culture, and history, including an epic trilogy on the Armenian Genocide comprised of Voices from the Lake, Germany and the Secret Genocide, and The River Ran Red. 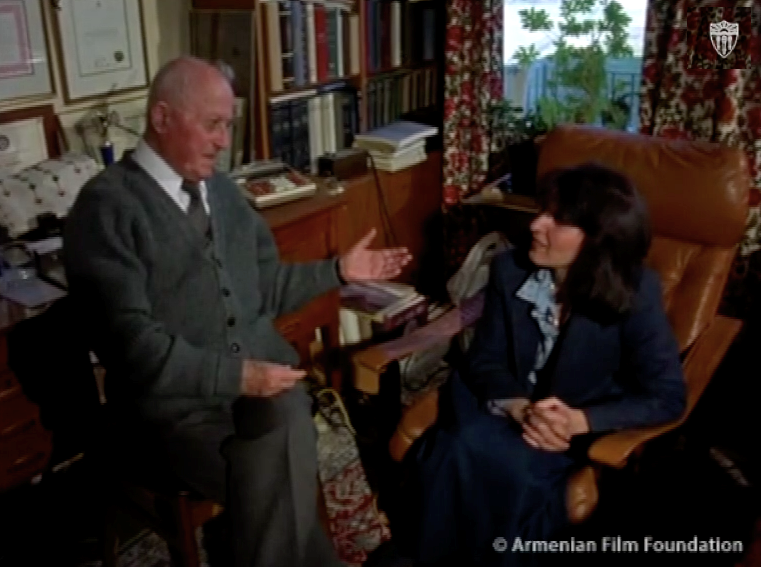 Recognizing the pressing need to record the experiences of Armenians who were subject to the genocide, Dr. Hagopian began conducting film interviews with survivors and witnesses in 1968. As aging survivors and witnesses of the genocide began dying in large numbers, the Armenian Film Foundation embarked on a massive project to interview those who remained. When the project commenced in 1982, an estimated 2,500 potential interviewees were still alive. Fifteen percent of these were subsequently interviewed, and their testimonies documented on 16mm film by the Armenian Film Foundation, which retains the original footage, sound tapes, record books, and relevant photographs, as well as other documentation that may have been provided by the interviewees. AGBU WebTalks is an online video series from the Armenian General Benevolent Union (AGBU) that captures and preserves the insights and passion of engaging, inspiring, dynamic thinkers from around the world, speaking on a wide range of Armenian topics. With these short videos, AGBU WebTalks seeks to create a rich repository of knowledge and provide online access to authoritative and reliable information to meet the demands of our connected and visual world. The platform brings exposure to scholars, thinkers and artists by making their expertise in Armenian language, history and culture available to the worldwide community in one easily accessible online resource. Project SAVE Armenian Photograph Archives is the premier archive of Armenian photographs in the United States. Headquartered in Watertown, Massachusetts, Project SAVE’s mission is to collect, document, preserve, and present the historic and modern photographic record of Armenians and Armenian heritage. Founded by Ruth Thomasian in 1975, Project SAVE Archives’ extensive and diverse collection of more than 40,000 photographs, as well as its growing library of oral history audio tapes, depict all aspects of Armenian life in the homeland and Diaspora, from the 1860s to present day. Project SAVE strives to increase knowledge of Armenian culture and heritage by encouraging the use of its collection of photographs by the widest possible audience. The Genocide Education Project (GenEd) is a nonprofit organization assisting educators in teaching about human rights and genocide, with particular focus on the Armenian Genocide, as the modern era prototype for the genocides that followed. GenEd develops secondary school instructional materials and provides professional development workshops to help educators successfully incorporate lessons on the Armenian Genocide and the common patterns of genocide into their social studies curriculum.